New York is the largest city in the United States, accounting for over 8.5 million people, it’s the number one attraction for millions of foreign tourists and it’s the biggest global business and commerce hub. As one of the largest natural harbors in the world, New York City grew as the main entry point in the United States since its establishment in the 16th century. In fact, between 1785 and 1790, NYC was both the national and commercial capital of the country. New York City is the home of the world’s two major stock exchanges, the NASDAQ and the New York Stock Exchange (NYSE). Both of them are located on the revered and infamous Wall Street. This 0.7-mile-long street which runs for eight blocks is the headquarters for several other major exchanges and important financial institutions. Besides, the name “Wall Street” is a well-known metonym for the US financial market and sector as a whole. Another chief attraction of the NYC’s Wall Street is the gold vault in the Federal Reserve Bank of New York, which is known for being located 80 feet below the street level and the largest gold repository in the world. 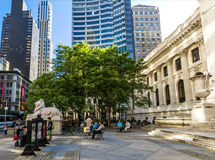 The FED’s New York branch is located nearby the Wall Street at 33 Liberty Street and is the largest, most influential and most active of the twelve regional Federal Reserve Banks. It’s one of the key players that implement the US monetary policy. Located in the New York state, New York City is considered the most economically and financially powerful US city and the leading national and international financial center. It’s ranked as the first city across the globe in attracting foreign capital. The city is the headquarters of many Fortune 500 corporations, many of them initially being founded outside the US. New York City is also a huge center of the country’s best gold, silver and jewelry dealers, most of them located in the heart of the Manhattan, the Diamond District Area. Manhattan’s famous Diamond District Area is located on 47th Street, between 5th and 6th Avenues. The district is a Business Improvement District (BID) where local businesses fund and promote services necessary for businesses dealing in precious metals and stones. It was founded at the beginning of the 20th century when the dealers started moving from two geographically separated districts. The Diamond District reinforced its importance during the World War II when thousands of Orthodox Jews were forced to settle their diamond businesses in NYC. Most of them stayed after the war ended, transforming this area into a global diamond industry area and the center of the NYC coin dealers. The United States Mint has its facility located near the U.S. Military Academy in New York. The West Point Facility of the US Mint was built in 1937 and was called the West Point Bullion Depository. The facility produces West Point (W) marked coins in gold, silver, platinum, and soon, palladium. West Point currently manufactures 1 oz., ½ oz., ¼ oz. and 1/10 oz. American Eagle Proof and Uncirculated Coins. The silver bullion coins are only produced in the 1 oz. denomination. 1. Bullion Exchanges One of the most reliable precious metal and coin dealers in NYC, located in the heart of the Diamond District. Address: 30 West 47th Street, Store 1, New York, NY 10036 Hours of Operation: 9 am-5:00 pm M-F; Phone: 212-354-1517, 800-852-6884 Services: Wholesale, Buying and Estate Liquidation, Retail, Auctions, Assists Collectors with Submissions, Collector Sales, Storefront, Helps Build NGC Registry Sets, and Appraisals. Specialties: United States Coins, Dollars, Gold Coins, 19th Century Silver Coins, Modern Coins, 20th Century Coins, World Coins, and Bullion Coins. 2. Manfra, Tordella & Brookes, Inc. Established in 1957, MTB is one of US largest bullion dealers. MTB is an Authorized Purchaser of Government Mints, Legal Tender Bullion Investment Coins and PAMP Suisse Fortuna Investment Bars. MTB provides for individuals and institutions the widest selection of international legal tender bullion coins and pure investment bars. Address: 50 West 47th Street, Suite 310, New York, NY 10036 Hours of Operation: 8am-5pm M-F; Phone: (212) 981-4500 Services: Retail and Wholesale. Specialties: Gold Coins, Modern Coins, US Coins, and Bullion Coins. 3. Anthony Terranova, Inc. Address: P.O. Box 985 FDR Station, New York, NY 10150-0985 Phone number (212) 262-8400 Hours of Operation: 8am-9pm M-F; Phone: (212)-787-5682 Services: Buying and Estate Liquidation, Appraisals, Auctions, and Wholesale. Specialties: United States Coins, Dollars, Gold Coins, 19th Century Silver Coins, Early Type, 20th Century Coins, Commemoratives, Modern Coins, Early Copper, Nickel Coinage, Small Cents, Colonial Coins, Territorial Issues, Patterns, Mint Errors, Bullion Coins, Tokens/Medals, World Coins, Currency, and Ancient Coins. 4. Hudson Rare Coins, Inc. Address: PO Box 5114 New York, NY 10185-5114 Phone number (212) 302-4653 Hours of Operation: 9 am-5:00 pm M-F; Phone: 212-819-0737 Services: Wholesale, Buying and Estate Liquidation, and Appraisals. Specialties: United States Coins, Dollars, Gold Coins, 19th Century Silver Coins, Early Type, 20th Century Coins, Early Copper, Commemoratives, Small Cents, Colonial Coins, Nickel Coinage, Patterns, World Coins, Territorial Issues, and Currency. 1. Brigandi Coin Company Address: 60 W 44th Street, New York, NY 10036 Hours of Operation: 9:30 am-5 pm M-F Phone: (212) 869-5350 Services: Appraisals, Storefront, and Collector Sales. Specialties: Bullion Coins, US Coins, Gold Coins, and World Coins. 2. Noor Address: 66 West 47th St., Booth 35, 36, New York, NY, 10036 Hours of Operation: 9 am-5 pm M-F Phone: (212) 764-1818 Services: Storefront and Collector Sales. Specialties: World Coin and US Coins. 3. Heritage Auctions Address: 445 Park Avenue, New York, NY, 10022 Hours of Operation: 10am-6pm M-F; Saturdays 10am-3pm Phone: (214) 486-3500 Services: Collector Sales, Auctions, Storefront, and Wholesale-to-the-Trade. 4. Professional Coin Galleries Address: 11-11 44th Road, Ste. 202, Long Island City, NY 11101 Hours of Operation: 9am-5pm Phone: (888) 244-3717 Services: Assists Collectors with Submissions, Appraisals, Helps Build NGC Registry Sets, Collector Sales, Storefront, and Wholesale-to-the-Trade. Specialties: Gold Coins, US Coins, and Morgan and Peace Dollars. 5. SNS Fine Jewelers, INC. Address: 36-20 30th Avenue, Astoria, NY 11103-4364 Hours of Operation: 12 pm-6 pm M-Sat. Phone: (718) 274-4550 Services: Storefront and Collector Sales. Specialties: Bullion Coins, US Coins, and Morgan and Peace Dollars. 6. Certified Coin Consultants Address: 8 S Village Avenue, Rockville Center, NY 11570 Hours of Operation: 10 am - 6 pm Phone: (516) 218-2094 Services: Assists Collectors with Submissions, Appraisals, Collector Sales, Wholesale-to-the-Trade, and Storefront. Specialties: Gold Coins, Morgan and Peace Dollars, Modern Coins, and US Coins. 7. Collectors Coins & Jewelry of Baldwin Address: 1846 Grand Ave, Baldwin, NY 11510 Hours of Operation: 9:30 am – 7 pm Mon-Sat. ; Sunday 11 am - 4 pm Phone: (516) 223-1212 Services: Assists Collectors with Submissions, Appraisals, Collector Sales, Wholesale-to-the-Trade, and Storefront. Specialties: Ancient Coins, US Coins, Gold Coins, and World Coins. 8. RBA Metals Corp Address: 267 S Central Avenue, Hartsdale, NY 10530 Hours of Operation: 10 am-6 pm M-F; Saturday 10 am-3 pm Phone: (914) 686-2646 Services: Assists Collectors with Submissions, Appraisals, Auctions, Storefront, Collector Sales, and Wholesale-to-the-Trade. Specialties: 20th Century Coinage, Early US Type, Bullion Coins, Morgan and Peace Dollars, Gold Coins, and US Coins. 9. Great American Coins Inc. Address: 11 Clearbrook Ste. 112 RD, Elmsford, NY, 10523 Hours of Operation: 10 am-6 pm M-F Phone: (914) 968-7900 Services: Assists Collectors with Submissions, Appraisals, Collector Sales, Wholesale-to-the-Trade, and Storefront. Specialties: Bullion Coins, Morgan and Peace Dollars, Gold Coins, and US Coins. 10. HH Rarities Consulting Address: 1965-2 New Hwy, East Farmingdale, NY 11735 Hours of Operation: 10:30 am - 4 pm Phone: (888) 793-3930 Services: Storefront and Collector Sales. Specialties: Early US Type, Morgan and Peace Dollars, Modern Coins, and US Coins. 11. Numismatic Assets, Inc. Address: 900 Walt Whitman Rd., Ste. 105, Melville, NY 11747 Hours of Operation: 10am-7pm M-F; 10 am – 3 pm Sat. Phone: (631) 425-6203 Services: Assists Collectors with Submissions, Appraisals, Storefront, Buying and Estate Liquidation, Wholesale, Auctions, Newsletter, and Retail. Specialties: United States Coins, Dollars, Gold Coins, 19th Century Silver Coins, Early Type, 20th Century Coins, Commemoratives, Modern Coins, Early Copper, Nickel Coinage, Small Cents, Colonial Coins, and Patterns. Territorial Issues, Tokens/Medals, Mint Errors, Bullion Coins, Ancient Coins, World Coins, and Currency. 12. All-american Rarities Inc. Address: 428 Lake Avenue, St. James, NY 11780 Hours of Operation: 10:30 am - 5:30 pm Phone: (631) 584-0707 Services: Storefront. Specialties: Morgan and Peace Dollars, Gold Coins, and US Coins. 13. Bellport Jewelers & Rarities Address: 148 South Country Road, Ste. B, Bellport, NY 11713 Hours of Operation 10 am-5 pm M-Sat. Phone: (631) 286-7700 Services: Assists Collectors with Submissions, Appraisals, Collector Sales, and Storefront. Specialties: Early US Type, Morgan and Peace Dollars, Gold Coins, and US Coins. 14. Southampton Jewelry Exchange Address: 801 County Road, Ste. 13, Southampton, NY 11968 Hours of Operation: 10 am-6 pm M-F Phone: (631) 259-2100 Services: Assists Collectors with Submissions, Appraisals, Collector Sales, and Storefront. Specialties: Bullion Coins, World Coins, and US Coins. 15. Oneonta Coin Company Address: 254 Main Street, Oneonta, NY 13820 Hours of Operation: 9:30 am-5:30 pm M-F; 10 am-5 pm Sat. Phone: (607) 267-4788 Services: Assists Collectors with Submissions, Appraisals, Auctions, Helps Build NGC Registry Sets, Collector Sales, Wholesale-to-the-Trade, and Storefront. Specialties: Gold Coins, US Coins, and Morgan and Peace Dollars. 16. Upstate Coin & Gold Address: 511 E Genesee St, Fayetteville, NY 13066 Hours of Operation: 10 am-5:30 pm M-F; 10 am-4 pm Sat. Phone: (800) 588-2646 Services: Storefront, Collector Sales, Wholesale-to-the-Trade, Buying and Estate Liquidation, Appraisals, Newsletter, Auctions, and Retail. Specialties: United States Coins, Dollars, Gold Coins, 19th Century Silver Coins, Early Type, 20th Century Coins, Commemoratives, Modern Coins, Early Copper, Nickel Coinage, Small Cents, Bullion Coins, Ancient Coins, World Coins, and Currency. 17. Bullion Trading LLC Address: 1156 Avenue of the Americas, 8th Floor, New York, NY 10036 Hours of Operation: 8:30 am – 4 pm M - Thurs. ; Fridays 8:30 am - 1 pm Phone: (212) 997-2520 Services: Storefront and Collector Sales. Specialties: Bullion Coins, Morgan and Peace Dollars, and Gold Coins. 18. Gold Standard Jewelry Corp Address: 21 West 47th Street, New York, NY 10036 Hours of Operation: 9 am-5:00 pm M-F; Phone: (212) 719-5656 Services: Storefront, Collector Sales, and Appraisals. Specialties: Gold Coins, Jewelry, US Coins, Watches, and Gold Buying. 19. Global Gold & Silver Address: 7 W 45th St New York, NY 10036 Phone number(212) 302-4653 Hours of Operation: 9 am-5:00 pm M-F; Phone: (212) 302-4653 Services: Storefront, Collector Sales, and Appraisals. Specialties: Gold Coins, Watches, Jewelry, and Gold Buying. 21. Stern Coin Company Address: 75 W. 47th Street New York, NY 10036-2823 Phone number (212) 354-4754 Hours of Operation: 10:00 am-5:00 pm M-F; Phone: (212) 354-4754 Services: Retail, Appraisals, Wholesale, Auctions, Buying and Estate Liquidation, and Newsletter. Specialties: United States Coins, Dollars, Gold Coins, 19th Century Silver Coins, Early Type, 20th Century Coins, Commemoratives, Modern Coins, Early Copper, Nickel Coinage, Small Cents, Colonial Coins, Territorial Issues, Patterns, Mint Errors, Bullion Coins, Tokens/Medals, World Coins, Currency, and Ancient Coins. 22. Spink Address: 145 W. 57th St. 18th Floor New York, NY, 10019 Phone number (212) 262-8400 Hours of Operation: 9am-5:00 pm M-F; Phone: (212) 354-4754 Services: Wholesale, Retail, Appraisals, Auctions, and Buying and Estate Liquidation. Specialties: United States Coins, Dollars, Gold Coins, 19th Century Silver Coins, Early Type, 20th Century Coins, Commemoratives, Modern Coins, Early Copper, Nickel Coinage, Small Cents, Colonial Coins, Territorial Issues, Patterns, Mint Errors, World Coins, Tokens/Medals, Ancient Coins, and Currency. 23. H & N Collectibles Address: PO Box 4113, Sunnyside, NY 11104 Phone number (516) 369-4104 Hours of Operation: 10:00 am-5:00 pm M-F; 10 AM - 4 PM (Sat) Available by appointment only Phone: (212) 354-4754 Services: Retail, Appraisals, Wholesale, Buying and Estate Liquidation, Newsletter, and Auctions. Specialties: United States Coins, Dollars, Gold Coins, 19th Century Silver Coins, Early Type, 20th Century Coins, Commemoratives, Modern Coins, Early Copper, Nickel Coinage, Small Cents, Colonial Coins, Bullion Coins, Patterns, Territorial Issues, Tokens/Medals, Mint Errors, World Coins, Currency, and Ancient Coins. 24. Jules Karp Coins & Bullion Inc. Address: P.O. Box 789, Wall Street Station, New York, NY 10268 Phone number (212) 943-5770 Hours of Operation: 9:00 am-6:00 pm M-F; 10 AM - 4 PM (Sat) Phone: (212) 354-4754 Services: Wholesale, Retail, Buying and Estate Liquidation, Appraisals, Auctions, and Newsletter. Specialties: United States Coins, Dollars, Gold Coins, 19th Century Silver Coins, Early Type, 20th Century Coins, Commemoratives, Modern Coins, Early Copper, Nickel Coinage, Small Cents, Colonial Coins, Bullion Coins, Patterns, Territorial Issues, Tokens/Medals, Mint Errors, World Coins, Currency, and Ancient Coins.